Mysteries abound in the Gamma-ray sky, and astronomers and other curious people want to know what's up there. Many attempts have been made to image the sky in Gamma-rays to identify all the "Unidentified Gamma-ray Objects" flying around the Universe. There's so much interest in these sources because Gamma-ray emission is produced by unusual objects and events: accreting black holes, ultra-dense neutron stars, eruptive flare stars, and others oddities. 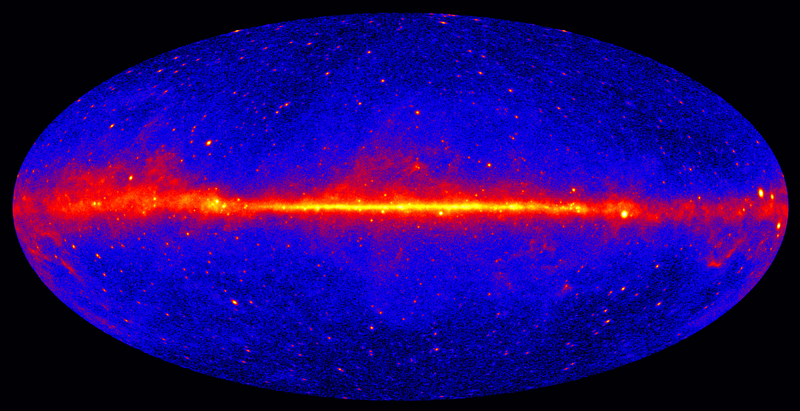 A recent survey of the Gamma-ray sky was carried out using the INTEGRAL Gamma-ray observatory, which discovered 939 sources of Gamma-rays in its search area. A somewhat surprisingly large fraction of them, 219 to be exact, were not associated with any previously known object. To help identify these sources, follow up observations at lower energies (in the X-ray and optical regions of the spectrum) are needed. The image above shows a sample of the results of this investigation. Figure 1a and 1b above shows observations with the NuSTAR high-energy X-ray telescope of the field near one of the unidentified INTEGRAL sources. The black circle and the concentric dotted circle shows the location of the INTEGRAL source at various levels of statistical confidence. While Figure 1a shows two NuSTAR sources in the INTEGRAL source region, the higher-energy NuSTAR observation shown in Figure 1b identifies the source near the center of the INTEGRAL source region (an active galaxy) as the INTEGRAL source. Figure 2 is an image obtained by the X-ray Telescope on the Swift high energy space observatory, and shows no bright source in the INTEGRAL error circle. Figure 3 also shows a Swift X-ray Telescope image of another INTEGRAL unidentified source, showing two sources within the error circle. Surprisingly, the fainter of the two X-ray sources is probably the source of the Gamma-ray emission seen by INTEGRAL.